the Rocky Mountains, flows east, gathers tributaries and after a journey of over 225 miles, eventually merges into the Bow. The two rivers form the South Saskatchewan that finally empties into Hudson Bay. 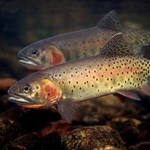 Most interesting to fly fishers is the upper 70 miles of the river, from its headwaters to the Peigan Indian Reserve. Located within the Rocky Mountains Forest Reserve, this section of river is narrow and gin clear. 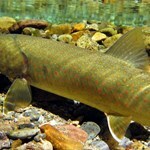 Both native cutthroat and fairly large bull trout can be found here. As the river continues southward, it picks up the Livingstone River and other smaller tributaries. At Racehorse Creek it suddenly turns east and flows through an aptly named passage known as the Gap. Open ranch land dotted with cottonwoods, aspen and pines characterize the river’s middle section. Here it’s not unusual to spot deer, black bears, grizzlies, elk, and of course, cattle. Fish here vary due to the introduction of rainbows throughout the 1920s and 1930s. 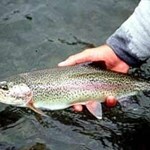 The result is pure cutthroats, pure rainbows and scores of hybrids. In early July, hatches of Western Green Drakes and Flavilinea give rise to great dry fishing. It’s possible to wade the middle section although its depth can be hard to gauge accurately and rock ledges can make walking difficult. Below the Oldman Dam near Pincher Creek, it’s possible to fish tailwater for about 7 miles. Fishing quality varies greatly from season to season so it’s best to check the status before deciding to go.